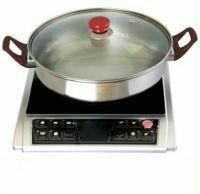 Induction cooker works on the principle of magnetic forces inducing heat energy. Here there is no heating coil and the associated power wastage. The bottom of the vessel alone gets heated due to electro magnetic induction heating. Here there is absolutely no risk of electric shock. Since only the bottom of the vessel heats up due to induction heating, there is no risk of burns. It gives you a clean, efficient, eco-friendly, safe and healthy way to cook.